Jupiter, Florida that is…..and in elegant style. His new $12, 500,000 palatial estate on the Bears Club Golf Course is nearing completion. The Bears Club was developed by “the Bear”, Jack Nicklaus, who many call the world’s greatest golfer and will soon be the new home for Michael Jordan, who a lot of fans still call the world’s greatest basketball player. Nicklaus acquired the huge piece of land, which had stood empty for many years, from John D. Mc Arthur and proceeded to build his ultimate dream golf course. There turned out to be so much land that Nicklaus and company sold off part of it to the Ritz Carlton there in Jupiter for yet another championship golf course. Of course, the golf course is surrounded by some pretty nice lots. High dollar properties as it were….and now with the new Jordan estate about to be completed, property values are sure to go even higher. When the caddies at the Ritz were asked what is the difference between the two clubs they responded that the homeowners on the Ritz course were all millionaires but that the homeowners around the Bears course were all billionaires. Michael Jordan has always desired to have his privacy respected and with this choice of properties, he will certainly have plenty of that. The 3 acre home site is already landscaped with surrounding trees and the private entrance at the Bears Club will provide adequate security for sure. The new home will consist of 3 different structures, a guard house, a pool house and a guest house totaling over 28,000 square feet of living space. Even a guy as big as MJ should be able to stretch out there in comfort. There will be 11 bedrooms and a modern athletic wing (complete with basketball court) as well as a huge media room with state-of-the-art electronics. Not surprisingly, it is “cigar friendly”. 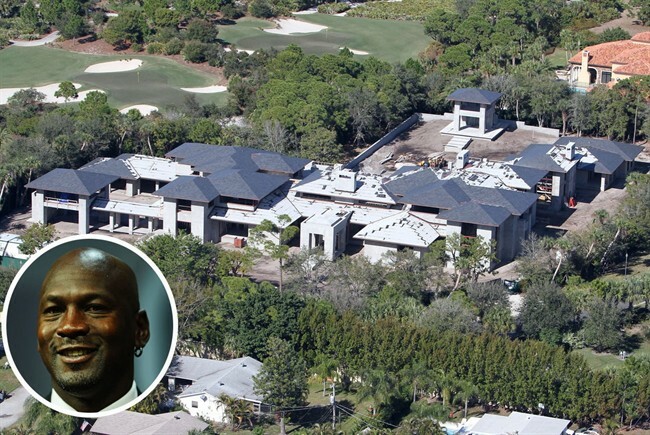 Jordan paid $4,800,000 for the property which is a pretty penny indeed in South Florida when the property has no water front access. The house itself will cost out at an additional $7,600,000. By the time he gets the place furnished, the total tab will probably top $20,000,000. One of MJ’s more well known neighbors there in Jupiter is Tiger Woods whose waterfront estate is said to be worth over $50,000,000. Nice neighborhood, eh!